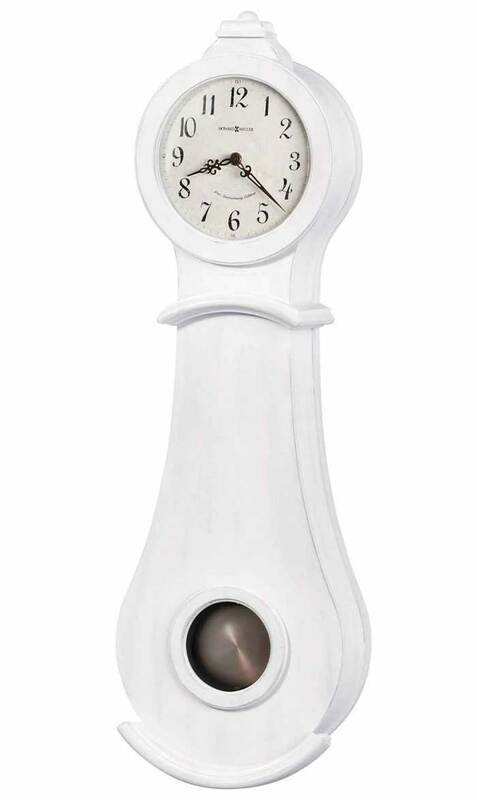 The Howard Miller Angelina 625-636 Wall Clock is part of Howard Millers New 91st Anniversary Edition of clocks. This clock has an aged look that is achieved through spatter marks, the use of a rasp, and well placed dents. The Antique White finish features brown undertones on select hardwood and veneers. The Angelina clocks that are made in 2017 will have the 91st Anniversary Edition inscription on the dial. The dial has an aged look with black Arabic numerals that look worn and charcoal grey hands behind a glass crystal that is convex. This clock features raised bezels that frame the face and the pendulum window. The stick pendulum has a circular blackened steel-finished pendulum bob. The crown is removable for two distinct looks. 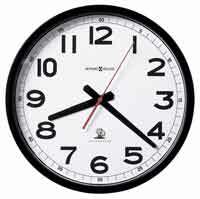 The accurate Harmonic quartz battery-operated movement requires two "C" batteries. The triple chime movement will play your choice of the full Ave Maria or Westminster chimes with strike on the hour, and the 1/4, 1/2, 3/4 chimes; Westminster chime and strike on the hour only; or the Bim-Bam chime on the hour only. It also has a volume control and nighttime shut-off option. 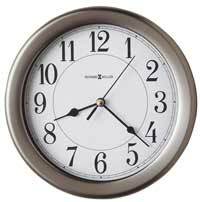 Clocks for sale at The Clock Depot including the 625-636 at discount prices.